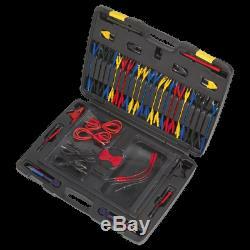 TA111 Sealey Test Lead Kit 90pc [Electrics] Diagnostic Tools Testers, Circuit. Comprehensive set of test leads and components suitable for testing, isolating and evaluating automotive electronic circuits. Includes standard Ø4mm banana style plugs and sockets suitable for use with most diagnostic multimeters and test equipment. 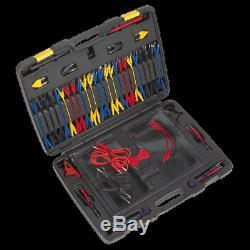 Supplied in sectioned carry-case for quick location of components. 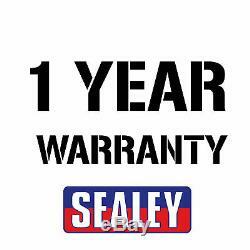 SEALEY TOOLS > Vehicle Service Tools. Condition: New with tags / New with box / New. Description: Comprehensive set of test leads and components suitable for testing, isolating and evaluating automotive electronic circuits. Comprehensive set of test leads and components suitable for testing, isolating and evaluating automotive electronic circuits. Model Name: Test Lead Set 92pc. Category Sub Group: Test Leads. Related Search Terms: Diagnostic Tools Testers, Circuit. (x2), Alligator Clip (x2), Back Probe (x4), LED 2 Colour Strobes (x2), SRS Connector (x2), 1:2 Connector (x2), 1:1 Connector/Cables (Piggy-Back) (x4), Probe (x2), Round Terminals with Banana Socket; Male (x3)/Female (x3) - 1.5, 2, 3.5, 4mm, Flat Terminals with Banana Socket; Male (x3)/Female (x3) - 0.7, 0.8, 1.2, 2, 2.5, 3, 5, 6mm. Welcome to YBCARS, UK Automotive Retail Specialists. We supply NISSENS, FIRST LINE, SCORPION, EUROCATS, BORG & BECK, FUCHS OIL, WIX FILTERS, GP BATTERIES and much more. To maintain our service we only select the market leading couriers to deliver our orders. Same Day Dispatch, Monday - Friday. A select few items may have a longer lead time as they may be specially ordered from our manufacturers. For any customers outside the UK mainland, Northern Ireland or Isle of Man, we can arrange, on your behalf, for your items to be delivered via a third party company within the UK who will then deliver directly to you. We want to give you a hassle-free way to return anything, either as a UK or an International customer. We want you to be totally satisfied with your order, so if for any reason its not suitable we are here to help. How do I return an item(s)? YB CARS Whybee Ltd Gaghills Mill GaghillsRd Waterfoot Rossendale Lancashire BB4 9BB. Returning a parcel from within the United Kingdom. When an item is Faulty. If you item is faulty, you may qualify for a pre-paid label, please contact our customer service team before you return your item for the best way to proceed. If you do not qualify for a free return you can simply send the item back to us via your preferred method, however we do recommend you use a traceable service so that you can track your items. (Only 1 free return per order). In most cases if you qualify for a Free Return a return label will be sent with your order for your to use. As an International customer, you can return your parcel using any postal service. Once the item arrives back at our warehouse, a member of our customer service team will contact you within 24hrs to discuss the return. And we will be happy to assist you further. During festive and sales periods this may be extended slightly. This product has no reviews yet, however see what our buyers say about our other products.. The item "TA111 Sealey Test Lead Kit 90pc Electrics Diagnostic Tools Testers, Circuit" is in sale since Saturday, September 15, 2018. This item is in the category "Vehicle Parts & Accessories\Garage Equipment & Tools\Diagnostic Equipment & Tools\Other Diagnostic Service Tools". The seller is "ybcarsuk" and is located in Lancashire.